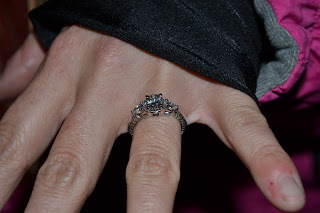 As Matt and I stood together, bundled against the arctic wind and -20 degree temperatures, something magical happened. It started as a slight green haze off to the left of the northern horizon, but as we watched, that haze began to move and grow, and right before our eyes the sky became a magic show of color and movement. The best I can say is that it looked as though God opened the heavens and sprinkled pixie dust across the blackened sky. Matt and I began to jump about and dance and hug each other…all of our waiting had paid off! 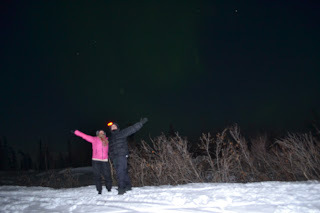 There we were, treated to our own private show of the great Aurora Borealis atop a hill overlooking Fairbanks, with the largest moon in 24 years glowing glowing proudly as it oversaw the whole celebration. 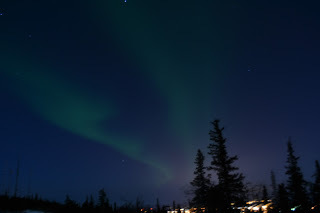 Unsure how long the Lights would last, Matt brought out his camera and tripod and began to take pictures. The process took a while, as the camera had to allow for a 30 second exposure to capture the lower lights, and afterwards there was a 30 second processing period. 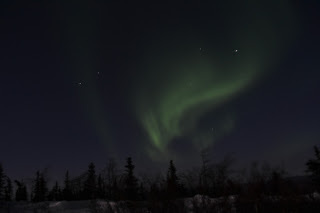 But each time the screen on the back of the camera revealed each shot, Matt and I would clap our hands and emit shouts of joy; each picture revealed a sky filled with greenish/blue light moving in magnificent strokes across the northern horizon. In a word: magical. 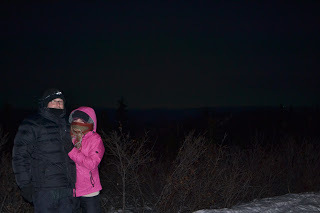 As the show continued, Matt stated we should take a picture together, so he set the camera on a timer and ran to take his spot next to me atop a snowbank, with the lights continuing on the horizon behind us. CLICK. Magical. “Will you marry me?” Matt shouted through his scarf, to be heard above the arctic wind. He revealed a box from between his heavily gloved hands. “What? !” I shouted back. Is this really happening? “Will you marry me?” The reality of the moment hint me. “Yes!” CLICK. The only part of me exposed to the elements were my eyes, and in that moment I saw only Matt, the love of my life, kneeling before me and asking me to spend the rest of my life with him. The Lights must have continued to shimmer and shift across the sky, and the moon must have continued to glow, but all I saw was Matt. I dropped to my knees and we embraced, forgetting for a moment that there were scarves between us, we pulled those away and kissed, unaware of the cold. 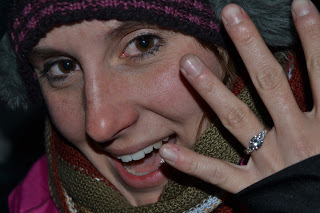 “You can’t even put the ring on my finger!” I held up a hand encased in a thick ski glove. So Matt gave me the shiny wooden box holding the most beautiful ring I’ve ever seen. 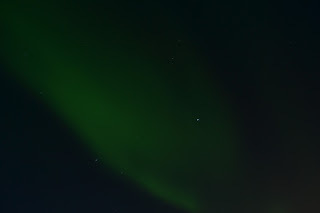 I closed the box and tucked it safely away in a zippered pocket so that Matt and I could continue to dance and photograph the Auroras. 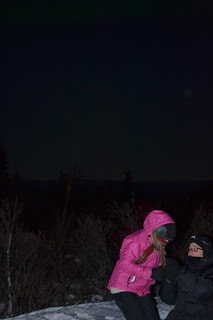 Around 5:30am, about 1.5 hours after the lights began, the sky began to dim, and the brilliant hues seemed to fade away until we were left with only the moon and stars painting the sky above. As we drove back to our hotel in the early morning hours, one of my favorite songs from the musical, The Sound Of Music was on repeat across my tired yet happy mind…what did I do to deserve all this? The rest of the night/morning passed in a blur, and to read more about the rest of our amazing engagement moon (it’s like a honeymoon, only better…trust me, it’s going to be a “thing”!) visit Matt’s blog here and here. To be honest, the reason it’s taken me several days to write this post, is because I’ve struggled to find the right words to express just how magical the whole experience was for me. But after listening to pastor Brian speak at Synergy church this past Sunday about the difference between communication and communion, I realized that’s not the point. To be in communication is to exchange information, news or ideas, but to be in communion is to share thoughts and feelings on a mental or spiritual level. Brian argued that most of us only focus on communication in prayer, ever on a quest to find the perfect words to say what we want, so that we often forget to seek communion. “Focusing on the right words in prayer, is like staring at a windshield rather than seeing through it,” he said. 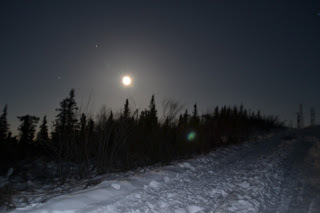 That night on the hill overlooking Fairbanks, I felt what pastor Brian was talking about. When you’re in the presence of such amazing love, the true beauty of that moment is not something that can be communicated, but rather must be felt on a deeper level. In that moment I felt absolute communion with Matt and the world around me, and I was completely overwhelmed; but in the best way possible. As a writer my life is about searching for the perfect words to describe people, places, ideas, dreams. But in this case I’m truly speechless…and happily so. More tears!! 🙂 Happy tears…of course!! Love your story!! Love You and could not imagine my son with anyone else.